Becky Yuncker MA LPC, Executive Director of the Northern Michigan Children's Assessment Center recent spoke to the Rotary Club of Houghton Lake regarding the progress in provided services and the number of children served by the center. The mission of NMCAC is to “prevent and educate the public on child abuse and neglect, as well as to reduce the trauma…by providing a timely, comprehensive and multidisciplinary response to allegations in a safe, child focused setting.” The Center has a full time forensic interviewer, family advocate, therapist, and conducts medical exams with the support of MidMichigan Health. Since January 2014, the center has assisted over 626 children. 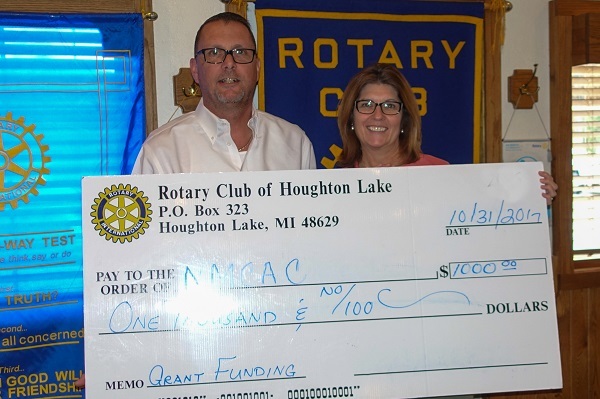 The Rotary Club of Houghton Lake made a $1,000 donation to support the NMCAC's outreach and prevention efforts. Pictured is 2016-2017 Rotary President Jim VanSice and NMCAC Executive Director Becky Yuncker.